The Categories feature makes it easier to schedule and store content in your Viraltag Dashboard. Take a look at the video or step-by-step tutorial below to know more about how to use this feature. 1. Head over to Settings by clicking the icon on the lower left corner of your dashboard. 2. Under 'Categories' click on 'Create Category'. 3. Add in as many Categories as you'd like, and click on 'Save'. 1. Click on the edit icon on each time slot, and assign a Category label to any time slots of your choice. 2. 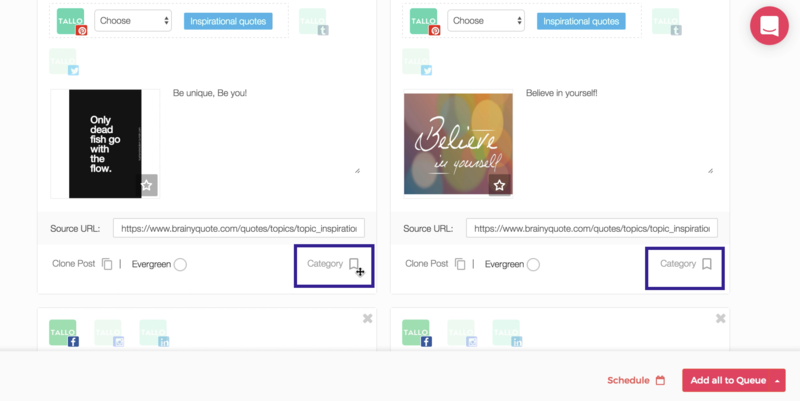 Create a customized Posting Schedule for each social network according to when you want specific posts to go out. For Eg. Quotes in the morning at 9:00 am and Promotional Content at 5:30 pm in the evening. 3. When scheduling posts, click on 'Category' to tag the post with a particular category. 4. Assign a Category to each post from the Drop down menu. In addition to this, add other details like choose the Social profile you want the post to go out to, add in a description and the Source URL. 5. Click on 'Add all to Queue' following this, and the posts will go out according to the customized Posting Schedule you set. 6. 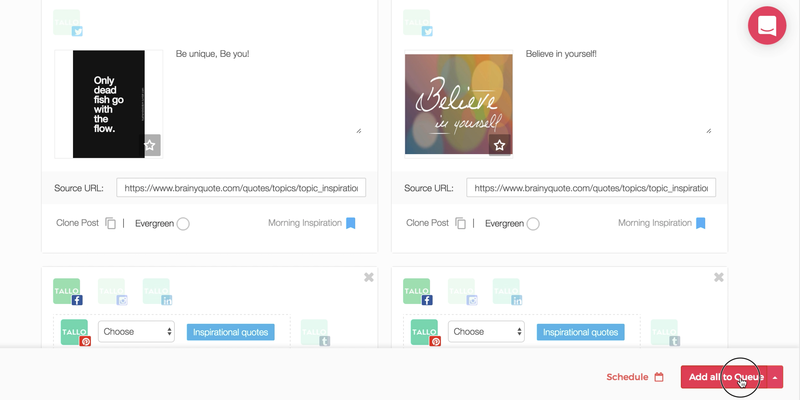 In this example, as the Category 'Morning Inspiration' was assigned to 9:00 am every morning in the Posting schedule, the posts are set to go out at 9:00 am. Categories can be great to organize content - for example if you want to organize all posts in your drafts for a specific promotion, you can simple assign a category while scheduling and filter by category to review them. 3. In the 'Drafts' section, you can filter content by categories and review them. This filter is there in the Recent Posts, Evergreen Content and Scheduled Posts tabs as well - This makes organizing and reviewing content in each section easier.